In case you have not noticed, there are plenty of federal agencies that gather information on the health stats of this nation. Health status indicators reports can give you useful information on how long people are living and whether they are getting the care they need in this nation. Stats of the Union uses information from various federal agencies to give users a snapshot of the state of health in America. Stats of the Union relies on the Community Health Status Indicators report to bring you information on demographics, births, deaths, diseases, and risk factors in this nation. It uses color codes to help you make better sense of the data. You can go through each category to get a more detailed breakdown. 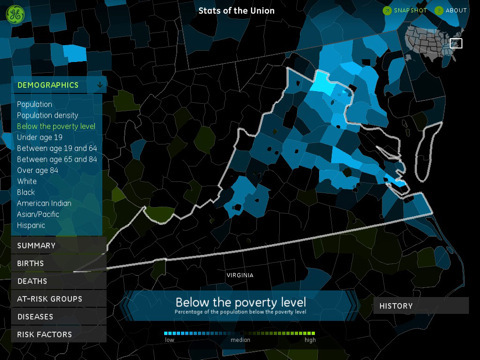 Stats of the Union has a ton of data and is quite visual. We would love for the developers to use different colors so we can see the data visualized in a more user-friendly fashion. 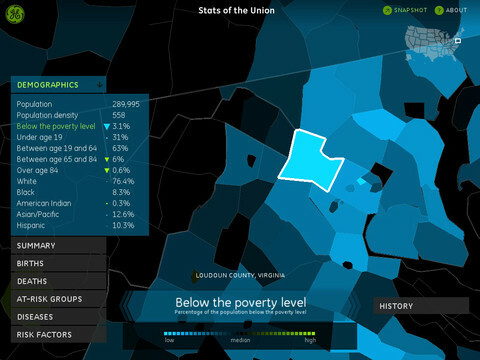 The app is interactive and lets you explore data from counties across the nation. 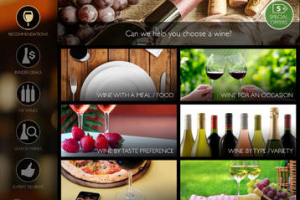 The idea behind this tool is solid but the execution could be much better.